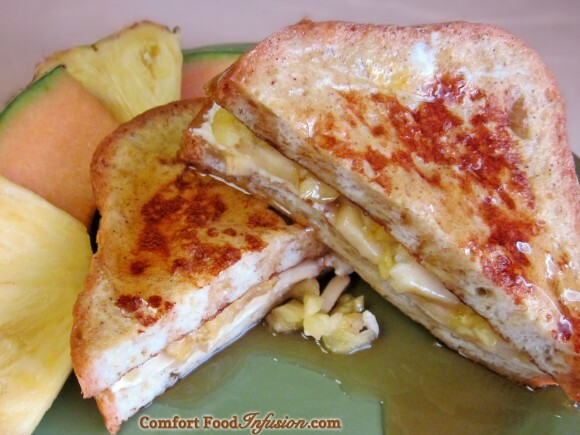 Pineapple Banana French Toast with cream cheese filling. Prepared as a sandwich, rather than ‘stuffed’. 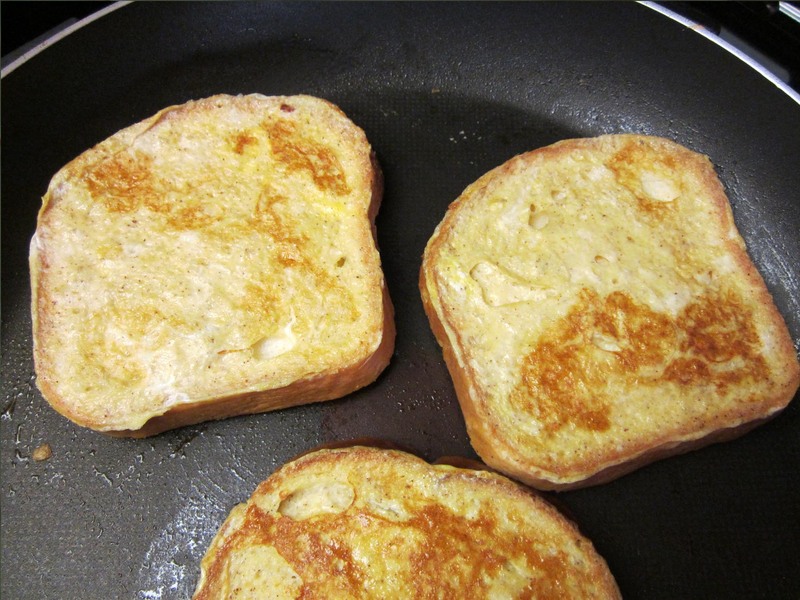 How many of you have had ‘stuffed’ french toast? I have, and admittedly, I love it. My favorite is one stuffed with cream cheese, pineapple and banana. It’s interesting though, when I first searched for a stuffed french toast recipe, I realized that I wasn’t crazy about the way it was prepared. I don’t even have a good reason why I wasn’t fond of the process. I guess my first thought was, I don’t think the egg will cook properly all the way through. Although, so long as you don’t let the bread soak up a TON of egg, that shouldn’t be a problem. Regardless of why it bothered me, I decided to go about my version a little differently. I simply fried my toast as I would if I was simply making french toast. 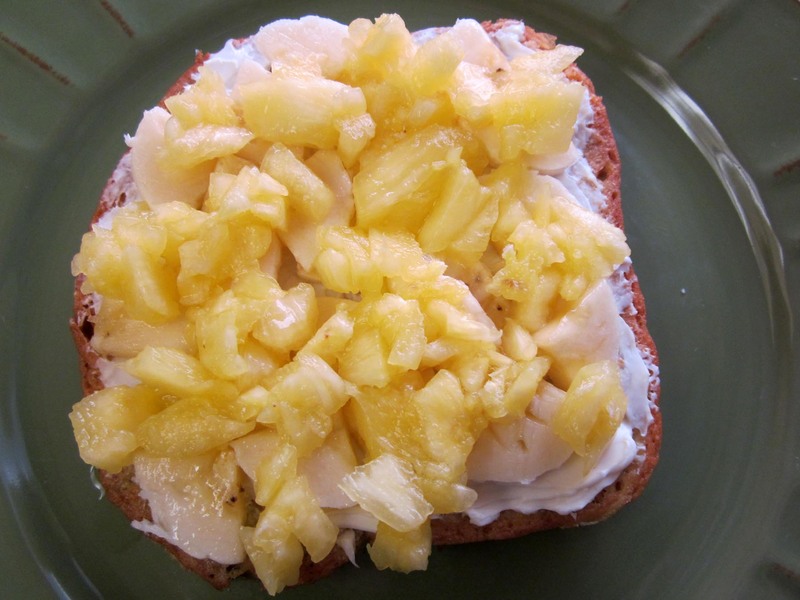 Then, once cooked, I simply spread on the cream cheese, added chopped fruit and finished it as if it were simply a sandwich… a sweet and indulgent sandwich, topped with powdered sugar and maple syrup. By all means, it can be prepared as a traditional ‘stuffed’ version, by first assembling the sandwich, dipping the outer sides in egg, and finally frying it. Either way, this is absolutely delicious! Finnish with second slice of french toast. Serve with powdered sugar and maple syrup. In a large, shallow bowl, whisk together the eggs, milk, cinnamon, nutmeg and vanilla. Dip one slice of bread into egg mixture, coating each side. Place bread in a fry pan heated over medium heat, and sprayed with cooking spray. Cook on each side for about 1-2 minutes or until golden brown. Remove from pan and transfer to a plate, and cover with a kitchen towel while finishing the batch. 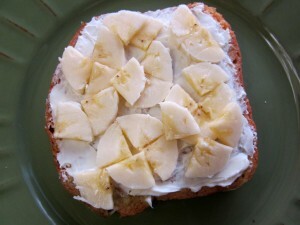 To four slices of french toast, spread on the cream cheese, top with sliced bananas, then crushed pineapple. Top each with a second slice of french toast. 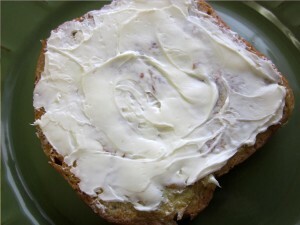 You can add a tablespoon or so of sugar to the cream cheese, if you want it sweeter.